President Trump signed an executive order April 24, 2019 that, in combination with the National Defense Authorization Act of 2018, section 925, shifts the primary responsibility for conducting background investigations for the federal government from the Office of Personnel Management to the Department of Defense. This executive order reflects the administration’s commitment to reform the personnel vetting enterprise to ensure a trusted federal workforce and achieve an efficient, effective, and secure operation that meets all government-wide needs for background investigations. The DOD will reorganize the Defense Security Service to best position the department to assume primary responsibility for the government-wide background investigation mission. DSS will be renamed the Defense Counterintelligence and Security Agency and will conduct all activities currently assigned to DSS and serve as the primary entity for conducting background investigations for the federal government. DSS (and subsequently DCSA) reports to the Under Secretary of Defense for Intelligence. Efforts to undertake the transfer of OPM’s background investigation function and associated personnel, resources, and facilities to DOD will begin immediately. A senior officer from Fort Lee, Virginia, died Monday after he was crushed by a car on the side of Highway 460, according to a Wednesday release from the Army. Col. Gregory Townsend, who had been the commander of the 23rd Quartermaster Brigade, stopped to help another driver change a tire on Thursday, but as he finished, the vehicle fell down on him, the release said. Townsend, 46, was airlifted to Virginia Commonwealth University Critical Care Hospital in Richmond, Virginia, where he died of his injuries, the release said. 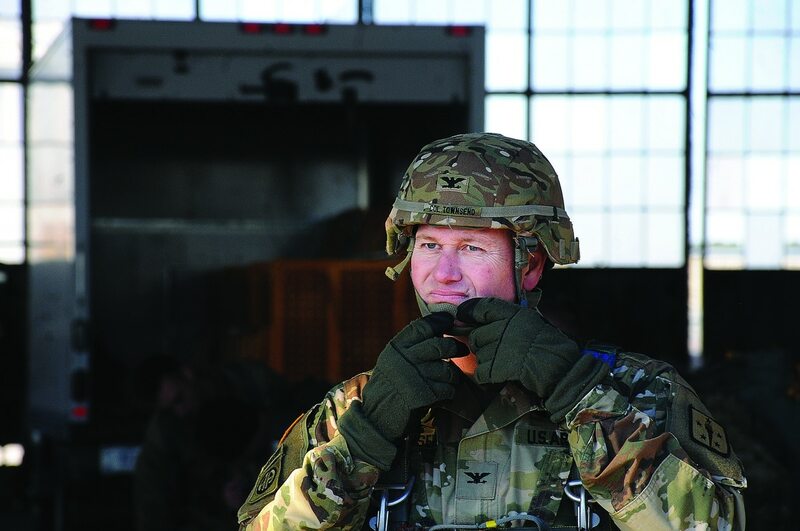 An Auburn University graduate, he joined the Army in 1996 and earned his commission as a quartermaster officer. He reported to Fort Lee in July 2017, the release said, to take over the brigade. FORT LEONARD WOOD, Mo. — More than 90 percent of those who attempt to become an Army diver fail in the first 14 days of training. The hopefuls are often overcome, physically and mentally, by rigorous drills meant to winnow down recruits to the elite few. The journey to become an Army diver begins (and often ends) at the Phase I course of the U.S. Army Engineer Dive School at Fort Leonard Wood, Missouri. In fiscal year 2018, only six enlisted Soldiers attained the 12D (Engineer Diver) military occupational specialty. Although nine graduated Phase I of their Advanced Individual Training, or AIT, only the six went on to graduate from Phases II and III held at the Naval Diving and Salvage Training Center in Panama City Beach, Florida. Sgt. 1st Class Eric T. Bailey, noncommissioned officer in charge and master diver for the 12D Phase I course, said a lot of the recruits arrive for training ill-prepared for what awaits them. The recruits have to pass a Diver Physical Fitness Test that, besides curl-ups and pushups, includes a timed 500-yard swim using the breast or side stroke, six pull-ups and a 1.5 mile run in 12 minutes and 30 seconds or less. They also need to pass the Class I Advanced Survival Swimmer Test. The ASST has five events including an underwater breath hold in which the trainees, in their full uniform, descend to the bottom of a 14-foot pool and swim the entire width of the pool on a single breath, touching the first and last of seven lane lines, before ascending. And that’s just Day 1. Throughout Phase I, students have to do increasingly arduous breath-holding drills, including “ditch and dons” which involve ditching their gear at the bottom of the pool then donning it again, making sure to clear their mask and snorkel. Bailey said the hardest part of the drill is for students to remain calm enough to don their gear even as their body urges them to breathe. The U.S. Army on April 23, 2019 awarded contracts to five companies to develop prototypes for the ground-combat branch’s new scout helicopter. AVX, Bell, Boeing, Karem and Lockheed Martin each snagged a development contract for the Future Attack Reconnaissance Aircraft program. FARA aims to provide the Army a new scout helicopter finally to replace the old Bell OH-58D Kiowa Warrior scouts the service retired in 2017. The FARA rotorcraft also will free up hundreds of Boeing AH-64 Apache attack helicopters that the Army has pressed into the scout role despite the Apache being too big, slow and heavy for the role. To adequately replace both the OH-58D and the AH-64, the new copter will need to carry sophisticated sensors and a heavy load of long-range weapons. It will need to be able to fly for hours at a time at speeds fast enough to evade enemy defenses, all in hot-and-high conditions that can sap a rotorcraft’s lifting power. The University of Mississippi, known better to college sports fans as Ole Miss, encourages veterans to attend with its Military Non-Resident Tuition Scholarship, which pays for the extra tuition that out-of-state students automatically incur. This scholarship is also available to the spouses and children of veterans if they meet certain requirements. The U.S. Army is launching a new merit-based promotion system for enlisted personnel that will reward qualified soldiers with more rank but also force “subpar” sergeants out of the service if they fail to meet the new standards. Personnel officials hope to have the improved promotion system fully operational by 2021, according to a recent news release, which describes how the service plans to post a 90-day forecast for all promotions — from sergeant to sergeant major. Army Human Resources Command, or HRC, intends to announce the names of all soldiers picked for promotion “on the 15th of each month, with an effective promotion date on the first day of the following month,” the release states. However, if soldiers are rated as subpar “and are unable to become fully qualified in their [respective] rank,” they will be advised that their “continued service may be at risk,” the release states. Once a soldier is found “not fully qualified” by a board a second time in the same grade, the Army will set a mandatory separation date six months in the future, according to the release. The U.S. Military Academy at West Point is finally getting a statue of Gen. Ulysses S. Grant, one of its most famous graduates, who led the Union to victory in the Civil War. It will be unveiled Thursday by the 18th president’s great-great grandson, Ulysses Grant Dietz, an art curator at the Newark Museum in New Jersey. The statue, by sculptor Paula Slater, presents a hat-less Grant in his four-star general’s uniform. The 7.5-foot statue of Grant, who stood about 5-foot-8 in life, was made possible by what West Point described as a “generous donation” from the family of Robert A. McDonald, class of 1975, a former Department of Veterans Affairssecretary. The unveiling marks the sesquicentennial, or 150th anniversary, of Grant’s inauguration as the 18th president. He served two turbulent terms during the “Reconstruction” era, West Point said in a news release. Statues of three other generals and West Point graduates — Dwight Eisenhower (class of 1915), Douglas MacArthur (1903) and George Patton (1909) — are already in place on the academy’s grounds, but plans for one of Grant did not get underway until the House Armed Services Committee recommended it to the Army in 2016, according to the release. House lawmakers will hear directly from the victims of military medical mistakes next week in a hearing looking at whether Congress should consider changing the rules regarding malpractice cases against the Department of Defense. Among those scheduled to testify at the hearing on April 30 are Sgt. 1st Class Richard Stayskal, a Green Beret fighting stage four lung cancer because of Army doctors errors, and the widow of Air Force Staff Sgt. Dean Patrick Witt, who was left in a vegetative state after a botched appendectomy surgery. At issue is a 1950 Supreme Court decision called the Feres doctrine which lower courts have cited repeatedly to block troops from claiming medical malpractice damages for actions related to their military service. The U.S. Army says it will meet its readiness goals by 2022, but young sergeants in most infantry and close-combat units don’t know how to maneuver their squads or do basic land navigation, Military.com has learned. For example, sergeants in the majority of the Army’s active brigade combat teams (BCTs) don’t know the importance of gaining a foothold when leading squads on room-clearing operations, according to a series of report cards from the service’s Asymmetric Warfare Group, known as the AWG. Since March 2018, the AWG — a special, operational advisory unit involved in training brigade combat teams in subterranean (Sub-T) warfare operations — has submitted reports to Army leaders on several occasions identifying trends that show small-unit leaders lack proficiency in key skills required for any type of combat, a Defense Department official with knowledge of the reports told Military.com on the condition of anonymity. Communication is the key to keeping West Point alive and relevant – within the Class, Societies, Parents Clubs ….and across the generations. In the very early days of the internet, WP-Org was created to facilitate communication by and between West Point grads. Simply put, WP-Org was in the forefront of internet communication. Safe, secure communication. Admittedly, over the past two decades, many other internet based modes of communication have gained popularity – and I certainly use them – with caution. However, when on the WP-Org sites, I don’t worry that my personal information will be harvested, nor am I bothered by ads that pop up because I clicked on a link. I know that when using the WP-Org email lists and websites, all is secure. There’s great value to all the other social media platforms that we use and enjoy (Facebook, LinkedIn, Instagram, etc) and with it’s customized, easy to use services, WP-Org can serve as the central hub for Classes, Societies and Parent Groups as the permanent repository and “action site” for events and information. I have personally appreciated the 24/7 support and access to relevant databases when helping coordinate events – big and small. My husband’s Class celebrated their 50th reunion last May – and frankly, were it not for the many services offered by WP-Org (email lists, web pages, credit card sites) the reunion would have been much more costly as we would have had to pay someone to manage the reunion for us. With the help of WP-Org and the forbearance of Dutch’s classmates, all enjoyed a fantastic multi-day event. Similarly, the West Point Society of Hawaii just completed another successful Founders Day event with over 260 attendees – and looks forward to using the services of WP-Org for their upcoming Army v. Hawaii football events. WP-Org is also known for its incredible customer service, with a “live” person answering your call or email 24/7. There hasn’t been a time that I could not reach out to either of the WP-Org employees (yes, only two keep everything humming along) and get immediate resolution of my issue or question. When you combine the customer service with the secure services offered, there is no doubt in my mind that WP-Org continues to offer a true value to all those affiliated with the West Point community. Please help us continue to serve you. After entering Donation Amount, login to PayPal account. On next screen, please click on “Add special instructions to the seller”; enter class year and affiliation, and comment if you wish.